Padstow, a town on the north coast of Cornwall, celebrates May Day with a unique custom: two hobby horses, or osses dance through the town streets, accompanied by drums and accordians. All Padstownians participate in this exciting event, which has now become a tourist attraction, drawing over 30,000 visitors the first of May to this fishing town of 3000. Folklorists Alan Lomax and Peter Kennedy visited Padstow in 1951, producing a film called Oss Oss Wee Oss (1953). In 2004, filmmaker John Bishop and folklorist Sabina Magliocco (with Jaynie Ali Aydin and Noah Bishop) returned to Padstow to see how the custom was faring fifty years later. 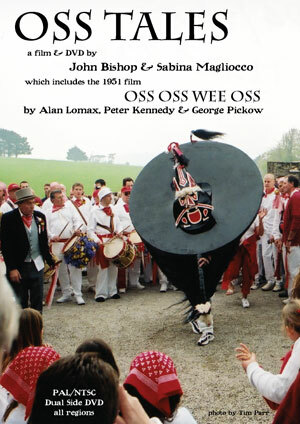 Oss Tales (2007) 25 min-- Re-engages the Padstow May Day in 2004. The film includes footage from Oss Oss Wee Oss and commentary by Peter Kennedy and Ronald Hutton, and people of Padstow. Oss Oss Wee Oss (1953) 18 min-- The complete film by George Pickow, Peter Kennedy and Alan Lomax in a new digital transfer. Oss Oss Wee Oss Redux: Beltane in Berkeley (2004) 14 min-- a portrait of a contemporary pagan group in Berkeley, California that yearly re-enacts the custom of the hobby horse as part of its May Day revelries. About the Oss Films (2007) 11 min-- George Pickow and Peter Kennedy talk about making the1953 film and John Bishop and Sabina Magliocco speak about making this DVD. A study guide is included on the DVD in PDF format. This DVD is all regions, and dual-sided-- NTSC on one side and PAL on the other. There is a review "OSS TALES Creating the Authentic" by Chas S. Clifton on his blog. And Awen Productions is doing great work documenting the deep cuture of Cornwall today.